Another term that I like because it’s so descriptive is “rogue provider,” which refers to low quality higher education providers that are not recognized by official accreditation bodies. Rogue providers have no oversight, no formal (and rigorous) quality assurance and maintenance procedures that they are required to follow. In short, there is no accountability. They can do whatever they please, wherever and whenever they want. Their overhead is generally very low and therefore their profit margin high. Success depends upon a steady supply of “customers” who want/need a foreign credential and who are generally not aware of the distinction between licensed, approved and accredited. 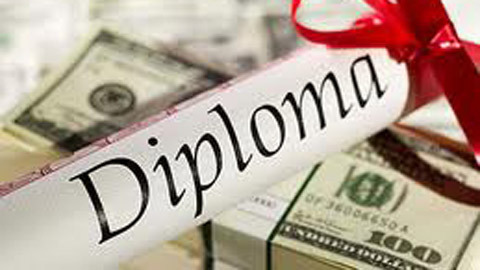 Unaccredited schools should be honest about their status and some of the limitations of earning an unaccredited degree but this is not likely to happen for obvious reasons. Those that are just getting started, are serious about providing high quality education/training and are planning to apply for accreditation at a later date, once they are more established, are the most likely to be transparent and the least likely to engage in deceptive business practices. Most of the schools on my list are mainly interested in making money and lots of it, sorry to say. Do the math – using a real-life example from Vietnam, if a program charges $8,300 per student and enrolls 120 students, then the organizers make a cool million, rounded up. This is a hot-button issue because it involves tangibles like money (i.e., it’s a multimillion dollar industry in Vietnam) and intangibles such as reputation, prestige, “face,” etc. It’s a form of corruption in the educational system. In Vietnam there are many unaccredited schools that waste people’s time and money. A free market does not mean freedom to exploit and defraud. Why Do I Have An Interest in This Issue? So why do I have an interest in this issue? Because it affects both Vietnam and the US in a myriad of negative ways. I have no hidden agenda, no ulterior motives and no ax to grind. In fact, it increases my “pro bono” workload. To the extent that US-based/affiliated unaccredited schools are successful in enrolling large numbers of Vietnamese students in programs of marginal quality who then graduate with largely worthless degrees, the reputation of legitimate (officially accredited) US higher education may be tarnished. In that sense this is a battle – pardon the military metaphor – that is being fought in both countries. The unfortunate reality is that most of the rogue providers doing business in Vietnam are “made in the USA” or attempt to wrap themselves in the American flag in order to positively influence the bottom line. A former professor and mentor, Dr. Philip G. Altbach, wrote about the importance of selecting quality academic partners in The World View: A blog from the Boston College Center for International Higher Education. The post, entitled The Company We Keep: A Cautionary Tale, begins this way: In international higher education, we are judged by the company we keep. Thus, it is of great importance that universities choose their partners carefully, make sure that their “brand” and reputation is protected, and that the partnership provides benefits to all sides. As we celebrate the 15 year anniversary of US-Vietnam diplomatic relations and reflect on the many “positives” in this flourishing bilateral relationship, it’s worthwhile to devote some attention to areas in need of improvement and issues such this one that adversely affect Vietnam and legitimate (officially accredited) U.S. higher education. There is a seemingly happy ending to this story. The second week of August Dr. Nguyễn Xuân Vang, director of the International Education Development Department of the Ministry of Education and Training (MoET) stated in an interview that unauthorized joint training programs are illegal and that the Ministry will not recognize the diplomas of programs offered in cooperation with unaccredited foreign partners. Follow this link to read the English translation of the interview: MoET will refuse degrees granted by low-quality joint training programmes. This is just what the doctor ordered, a salve for this societal growing pain. I think it was the former Chinese leader Deng Xiaoping who once said “Open the windows, breathe the fresh air and at the same time fight the flies and insects.” While the windows remain open in Vietnam, I do see the slow but sure installation of screens on some windows related to learner protection. It’s progress. 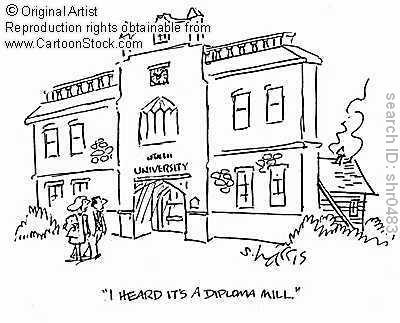 With thanks to a fellow blogger, Nguyễn Văn Tuấn, for use of the two diploma mill images you see here. Imitation is the sincerest form of flattery, phải không? Very good article, Dr Ashwill! Thanks also for referring to Prof Altbach’s blog entry. It’s very useful and interesting.